OK, I’ve lived in Southern California and Arizona all my life so I’m like a fish out of water right now. 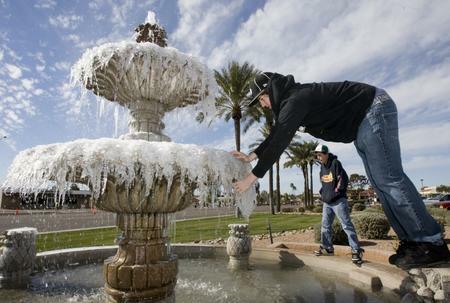 Global warming has caused ice to form on the streets of Tempe, AZ (I have that right I think, I saw The Day After Tomorrow). I almost fell over trying to get to someplace to each lunch. Its 2:30pm and there is still ice on the sidewalks (though it is melting fast). I know someone is going to die when their head cracks open after they fall (or pull their groin).